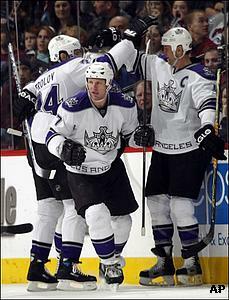 DENVER (AP) -Kings coach Marc Crawford heard a strange sound in the locker room - laughter. The upbeat mood finally returned as Los Angeles ended an eight-game losing skid. Derek Armstrong and Scott Thornton scored goals 1:17 apart in the third period, lifting the Kings to a 3-1 win over the Colorado Avalanche on Saturday. "It's extremely gratifying for our guys," Crawford said. "You can hear them whooping it up after the game. It's a nice sound to hear because we've been so dejected after most of these games." The Kings also picked up their first road win since Nov. 28 at San Jose. "We've been on a little bit of a slide," Thornton said. "We've been close in a lot of games, but obviously that's not good enough in the NHL." Los Angeles had only 10 shots on goal through the first two periods, but the offense roared to life in the final 20 minutes, peppering Jose Theodore with 13 shots. Armstrong tied the game at 1 midway through the final period, clanging a shot off the post for his third goal of the season. Thornton followed with a slapshot from in close for his third of the season. "We came out a little sluggish the first couple of periods, but we stuck with the system," Armstrong said. "I think that's what we've got to do a little bit more." Colorado pulled Theodore with 55 seconds remaining, but Anze Kopitar wrapped up the win on an empty-net goal with 16.4 seconds left. It was Kopitar's 16th goal of the season. "I thought our guys had a lot of life in the third period," Crawford said. "After we got the first goal, you could really sense we got a little more at ease." Theodore was filling in for Peter Budaj, who was given the day off after making seven straight starts. The Avalanche staked Theodore to a 1-0 lead on Jordan Leopold's goal in the first period, but he couldn't make it stand up. "They came out good in the third, and had some chances, and they ended up winning the game," said Theodore, whose team drops to 15-2-1 this season when scoring first. "We were patient," Aubin said. "We got our chances in the third and buried them. It's good to get a win. It feels really good." Leopold scored his second goal of the season off a pass from Wojtek Wolski in the first period. The defenseman has been out the last four games with a cut on his right leg, the latest ailment in an injury-plagued season. He's also missed 21 games with a wrist injury and two more due to hip problems. "It's been a challenge," he said of his battle with injuries. "It felt good (to score). Obviously, it feels better when you win, but it's nice to get one." The Kings were just elated to have the losing streak snapped. Of their eight losses, four were by a goal. "It's great for them," Crawford said. "They can now, hopefully, continue that feeling. Confidence comes from results, and we got a result tonight. Hopefully, we can build on the result." Notes: Los Angeles F Mike Cammalleri missed his second straight game with a rib injury. ... Colorado F Andrew Brunette has appeared in 409 straight games, the second longest active streak in the league. ... Colorado captain Joe Sakic underwent successful hernia surgery on Friday. He's expected to be sidelined for eight to 12 weeks. Sakic, who's in his 19th season, is the franchise's career scoring leader with 1,611 points. ... Los Angeles F Alexander Frolov set up Armstrong's goal with his 19th assist of the season.